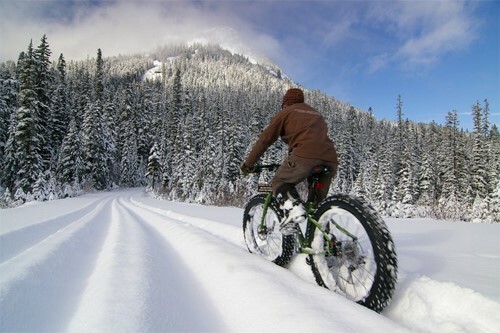 Fat bikes, with tires up to 5″ wide, first originated as vehicles for Iditarod support teams. 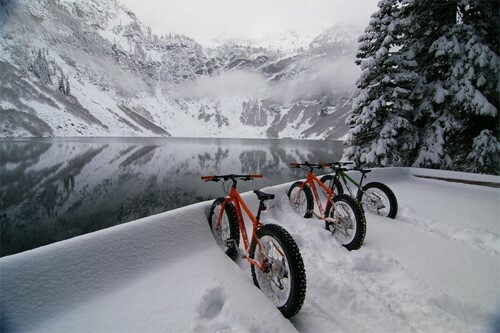 The extra wide, low pressure tires combined with light weight aluminum or titanium frames allowed the bikes to literally float over the snow. Since then fat biking has spread to riding in river beds, on beaches, and across trackless deserts. There is no learning curve with fat bikes. With such wide tires, it’s hard to make them fall over, unlike a typical road bike that often has only a 1/4 inch of tread on the road. The downside is that all that extra drag means your quadriceps are going to get a major workout if you ride very far. Now the sport has come full circle as riders are discovering that riding on snow is not only a great workout, it’s a blast, too! Curbed magazine says that many ski shops from Maine to Colorado are getting in on the craze by renting fat bikes alongside traditional ski and snowboard rentals. Be aware, though, that riding a fat bike is illegal at many ski areas, even after the lifts close. Be sure to check for local rules before you ride in the snow. And unlike skiing, riding a fat bike in winter conditions requires special, close fitting equipment that will keep you warm without getting caught up in the pedals or spokes. Curbed recommends Paragon Tours in Telluride, Tahoe Mountain Guides, and Sun Dog Athletics in Aspen as places that excel at providing bikes with the right gear and the right advice. Also check out the Alley Loop Nordic Marathon in Crested Butte, Montana. For more suggestions, read up on more about winter fat biking in Curbed magazine.